1. Don’t rent a camper van! OK, this one is just a personal pet peeve, and you are more than welcome to fill up the narrow roads of France with these totally unnecessary machines. 2. If you do rent a camper van, take plenty of vacation time. 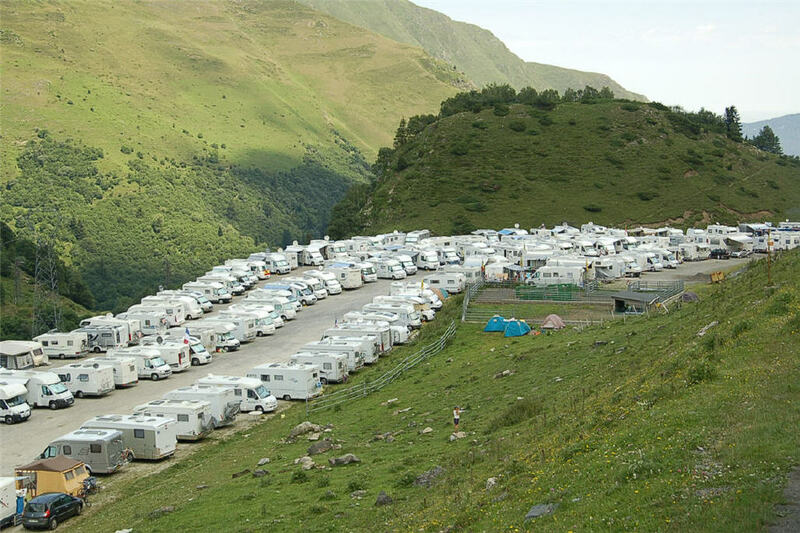 When driving through the Alps a few years back I was a bit surprised to see camper vans lining the steep climb above Val d’Isere, ONE WEEK before the Tour was going to pass that way! You’ve been warned. 3. TV (or Internet) is really, honestly the best way to see the Tour. The excellent thing about an event 3 weeks long is you can see some of it in person and most of it on the tube. 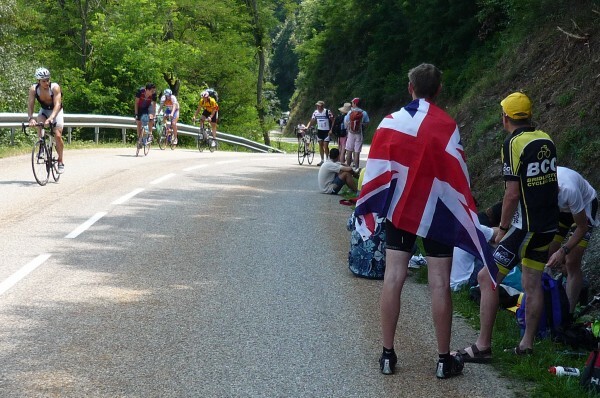 If it’s Internet check out Steephill and Cycling Fans for coverage details. In the past few years I’ve been able to watch it all live with actual sound…a long way from the days I spent (really, I did this) reading text updates from Eurosport, who by the way, have excellent commentary throughout the race. 4. Get drunk AFTER the finish of each stage. Riders slogging up a 15 km mountain at 12% gradient don’t need dicks slapping them on the back or slobbering in their faces…but who knows, maybe they really like it! 5. Check out some unpopular stages. Part of the magic of the Tour is the festival atmosphere that lights up every miniscule hamlet along the route. Find one of these on a stage nobody can make it to and soak up the atmosphere. 6. Book early. Hotels actually book out BEFORE regular folks even know where the Tour will be going, so once the official announcement is made (early-mid October) better be quick. 7. Get there early. The caravan, a totally unique, hour-long moving advertisement, precedes the riders by about an hour. The roads are closed at least an hour before the caravan (much, much earlier on mountains stages), so if you want to get where you’re going, make sure you are there 4 hours before the riders are expected. This information is easily gotten at the TdF site. And coming! Admittedly, you have to run back and forth, but this year in Monaco the toilets were near the start anyway, so there was a good reason to check the riders taking off. 9. Do some research. Know your Gilberts from your Schlecks. Having some previous exposure to the riders on the Tour will make your experience much more rewarding. Also, watch a few races before the Tour (the Giro is an obvious choice, and available on the links above) so you have an idea of race rules, conduct, etiquette, etc. 10. If you need to see riders up close, install yourself near your chosen bus a couple hours before the start for warmups. Imagine the scene below with a team of sweaty cyclists of your choice and you’ll get the idea. 11. Come equipped. Having a radio or a smart phone (TdF…there’s an app for that, too) will make the experience a lot more rewarding, since you’ll be able to know the race situation before the riders reach you. 12. Go to the bar. In French towns the local bar will always have the Tour on, so after they riders fly by, hurry over and enjoy the rest of the race with the comfort of a cold beer! 1. Get there (really, really) early. Roads will be closed many hours before the caravan arrives, but I am not sure how you can know when. If you want to drive to the top (assuming there is parking) get yourself there early in the morning, or even the night before. 2. If you don’t mind walking up, drive as close to the start of the climb as possible and…hike. 3. Choose your spot wisely. Sharp corners where you don’t see anyone till they are at your feet are probably not the best places. Long straight stretches, or near the end of wide turns are good, as are the tops of hairpins, since you’ll be standing right over the riders as the dance up. The first part of the climb is not the best either, in my opinion, because the peloton might still be together, making your viewing experience too quick. Get up the mountain as high as you can, so you’ll be sure that the riders are well strung out. Very steep sections are great as well because the riders will be going relatively slow. 4. Ride up, if you dare. Thousands of riders climb the route on race day; it is a real tradition. Get there early because the police will make you walk the bike an hour or so before the caravan arrives – maybe more. 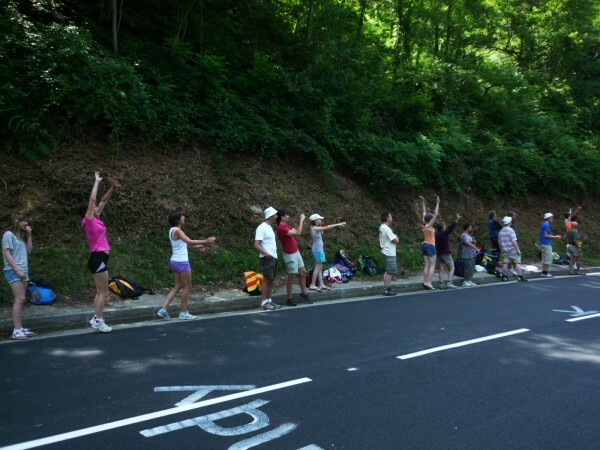 Climbing is great because the road is obviously closed, plus you get plenty of fan support on the way. You might also get lucky and be able to descend with some pros when they ride back down after the race. 5. Goes without saying perhaps, but take along sunscreen and water. Other than the ice cream truck before the caravan and the Vittel girls with the water hoses, you’re probably out of luck for liquid refreshment. High mountain climbs go above the tree line, so you could be totally exposed to the sun. This entry was posted in Cycling, Tour de France and tagged tour de france tips, watching tour de france. Bookmark the permalink. Thanks, Carolyn. You live in a lucky place for the Tour! This is very helpful. I am planning to see TdF myself this year for the first time and was wondering what to expect. Thank you for great tips, and I sure will climb up mountains by bike!! Yes, do if you can! Have fun and maybe see you on one of the cols this year.